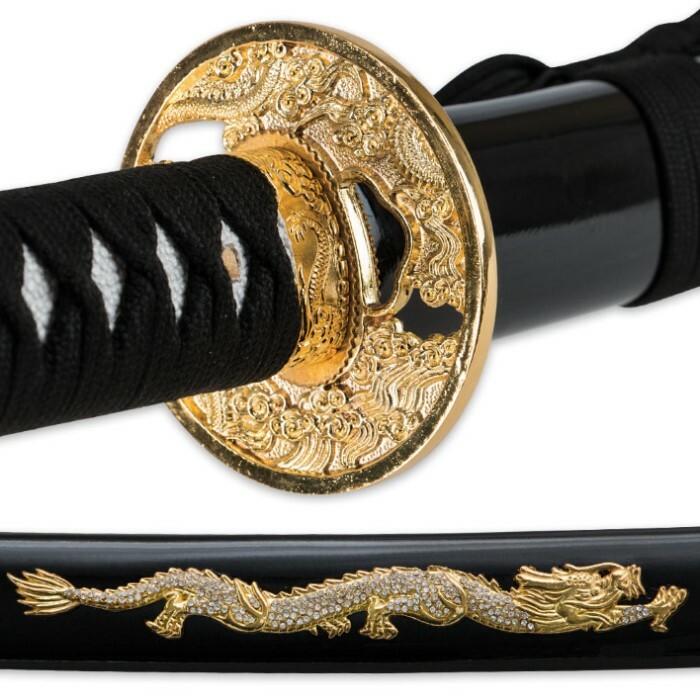 Samurai Warrior Carbon Steel Katana Sword - Black | BUDK.com - Knives & Swords At The Lowest Prices! This handmade masterpiece will leave you astonished every time you behold its beauty. Each one features a hefty carbon steel blade, hand-sharpened to yield a razor-sharp edge. Ornate embellishments like the brass tsuba, menuki and pommel accent the luxurious ray skin handle. 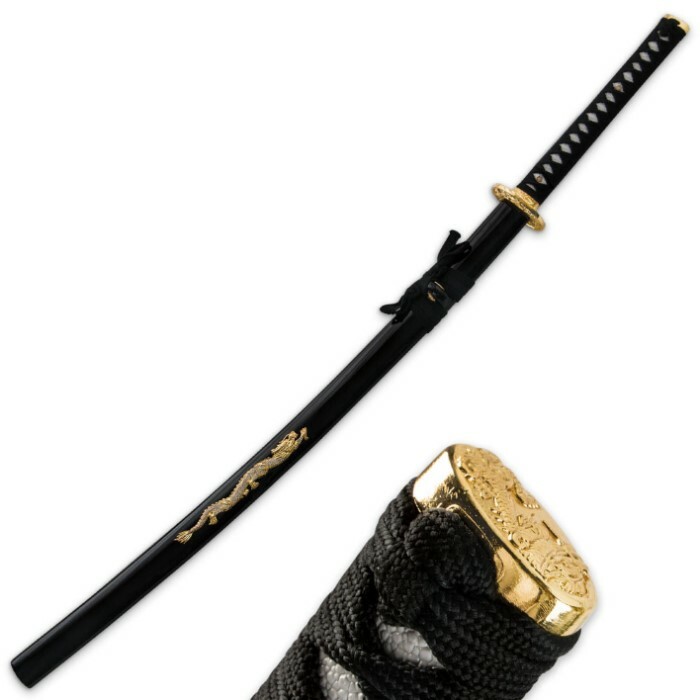 Generously wrapped in heavy black cording, the handle is a work of art in itself and provides a ninja-strong grip as you wield the powerful blade. A hand-painted wooden scabbard features additional cord accents and houses the 27 1/2" blade. Measures 40 1/2" overall. Its far from razor sharp but that can be fixed. But i also had to fix the bent blade and the loose brass fitting. Also i dont believe its 1045 steel due to how easy i bent it back streight and i have other true high carbon steel blades to compair it to. But that being said its a nice sword to look at and if you have the time and patiance you could make it usable on mats but be ready to bend it back streight. Also i belive the bend is not achieved by tempering. If you are looking for a good, solid practice sword then look no further. This katana is a good value at the price. While it comes semi sharp(no where near razor sharp) it is simple enough to hone the edge. It is fairly well balanced and handles well enough. A little disappointing as always to see made in China markings but at 60 dollars a chinese drop forged sword is usually what you will get. But all of that aside it cuts well. I did the classic full water bottle tests for slicing tests along with branches of varying thicknesses. I also slashed into a coconut, husk and all, and with a semi powerful attempt cut about 2/3 of the way through. It also penetrated the whole coconut during puncture tests. After some abuse the blades edge held up fairly well although the tip was a bit bent but that was to be expected. No wobble or bending in the blade. Still holding strong. 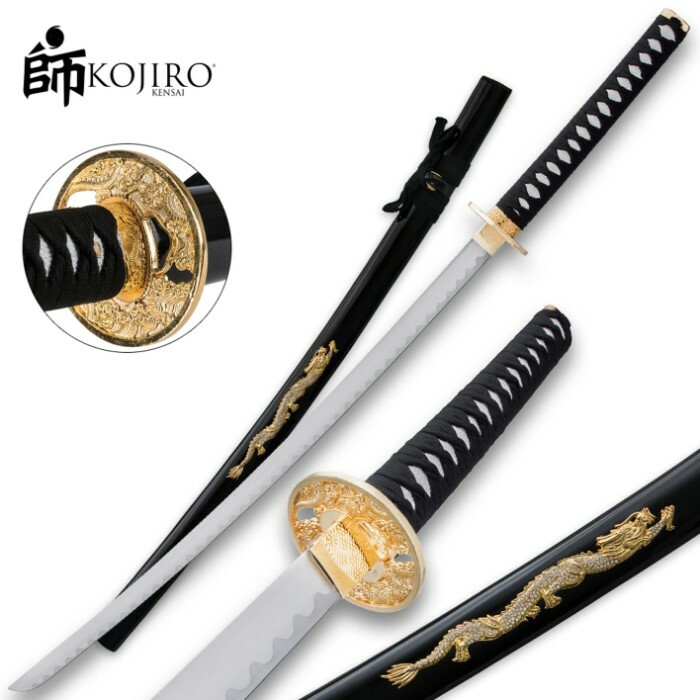 The Habaki(the brass fitting at the base of the blade) moves ever so slightly and the Ito(the wrapping around the handle) bunches up and moves with use. But both of these factors are negligible.So if you are looking for an affordable yet useable practice katana then do not hesitate to grab this one and get to work. I would have expected to pay more for this one than I did. It is full tang, razor sharp blade, with a beautiful metal dragon on the scabbard decorated with imitation diamond chips embedded in it. This one is the best katana in my collection of twelve, and there is not Made In China marking on it, making it more authentic. Would have expected to pay twice as much for this beauty. If you want a battle ready sword that looks like it came from a nobleman, this is the one to get. A masterpiece!